Since getting engaged in June I've had a lot of questions lately about how Jake & I got engaged, how we met, and all that good stuff. Everyones a sucker for love! So I thought I'd answer some of the questions. Yep, Jake & I met about nine years ago during our freshman year of high school. We were both in band. For the first few years of high school we were really good friends and ran with the same crowd. We both liked each other for a while, but it took us a bit of time to admit it. We finally started dating the summer before our senior year of high school. Jake ended up going to college in Oklahoma and I went to school in Tennessee, a bit far from each other, but we decided to give long distance a try. I think long distance always gets a bad rep, and for valid reasons, it is a challenge, but I think a lot of good can come from long distance. Being in separate places for college allowed us to focus on ourselves as individuals and our passions, while still being able to grow together. We pretty much only saw each other in person on holidays or school breaks, so communication was really important. We made it a point to FaceTime or call everyday. While texting is great and convenient, it's not the same as talking to someone. You don't get the emotional connection you would from seeing the individuals face or hearing their voice. We made it through four years of long distance and now we're happily living in Seattle. Long distance definitely wasn't easy, but I'm honestly very grateful for the experience because I think we're stronger as a couple because of it. Being apart from someone you love for extended periods of time really makes you value them in a new way. After graduating college, Jake and I had a wonderful opportunity to take three weeks and travel to Europe. While we were in Venice we got engaged. Funny story, apparently Jake was planning to propose to me on our anniversary in Florence. So he planned an extravagant dinner. However, we stopped in Venice before Florence. Our first night in Venice was incredibly romantic. Nothing was planned, it just happened. We walked to a cute restaurant near by and had some incredible pasta and wine. There was some romantic live music and then we took a walk along the canal. Upon arriving back at the hotel after dinner and our walk, Jake proposed saying, he just couldn't wait anymore and tonight was so romantic. It was wonderful and of course I said yes! I was surprised because I knew he had a plan and I didn't think the plan was in Venice...and it wasn't, haha. So when we got to Florence we got to go to the extravagant dinner he had planned out, where he originally wanted to propose. It was on top of a hill with a gorgeous view, the restaurant was perfect, fabulous food, wonderful wine, and a piano player too. Needless to say I felt like a princess for that entire week. My engagement ring is super special because it is ethical, eco-friendly, and gives back. I really wanted my ring to share my values and truly represent love. My engagement ring is the Crown Vintage Engagement Ring by MiaDonna! I am absolutely in love! The detail is absolutely gorgeous! The Crown Vintage Engagement Ring is crafted with recycled white gold, recycled diamonds on the side of the ring, and a beautiful ethical, lab-grown diamond center stone. Fun fact, lab-grown diamonds are physically, optically and chemically the same as mined diamonds! Not only is my ring ethically crafted & eco-friendly, but it gives back too! To read more in depth about my engagement ring & MiaDonna's mission click here to read my post dedicated to the ring. 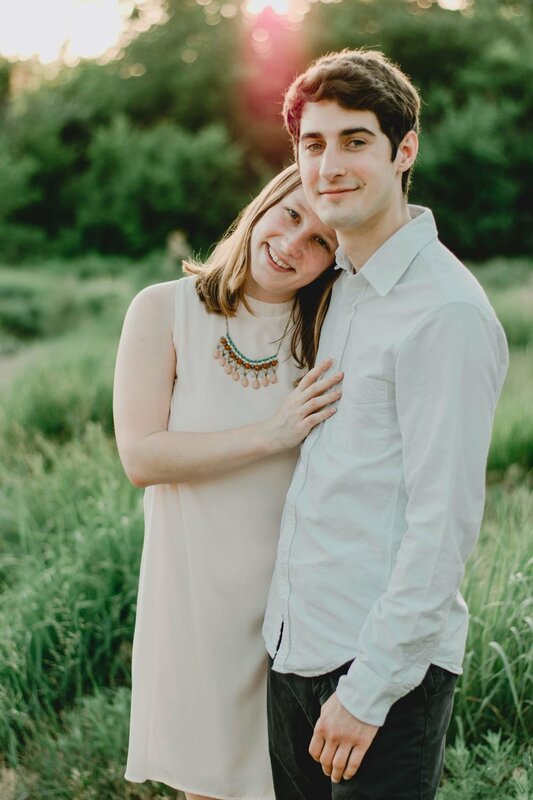 Our engagement pictures were done by one of our best friends, Sarah. Sarah recently launched Our House Photography. She is super talented. 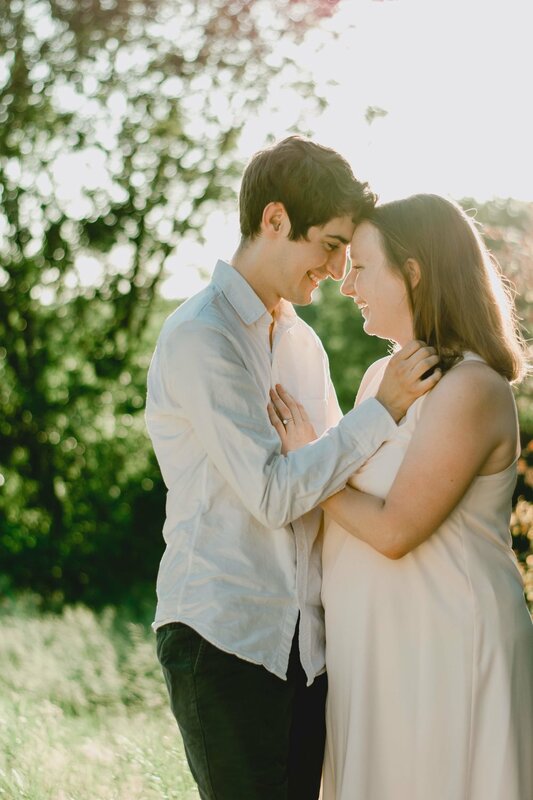 We had the best time because we had two of our best friends at the engagement shoot with us, so it was very relaxed and they kept us laughing the entire time. Fun fact, the blue dress I wore in some of the engagement photos is a secondhand dress. It was a great way to keep my pictures fashion and sustainable. And the beautiful light pink dress is ethically made and from Sweet Lupine, a great online store for ethical fashion at affordable prices. We're decided to have a long engagement because we just recently moved and are still trying to get settled. But I am so excited to plan a socially responsible wedding! I've already found some incredible ideas I'm excited to share with you all. 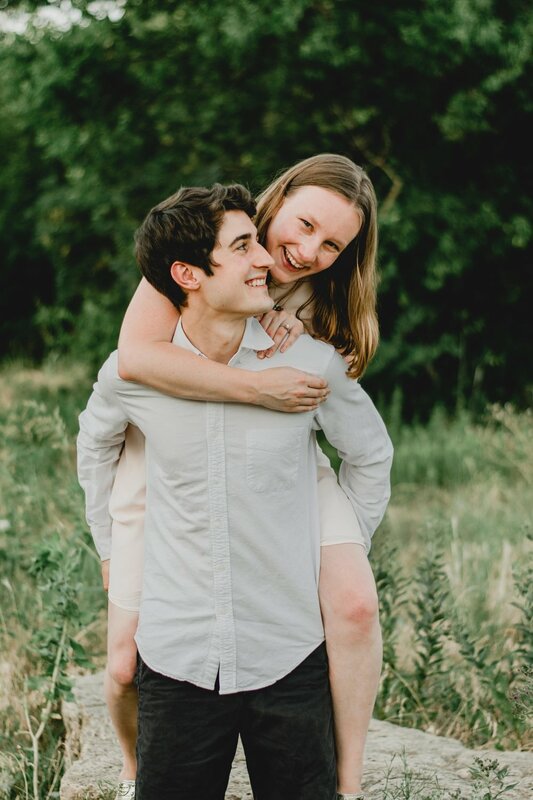 To follow along with my sustainable wedding ideas and planning be sure to follow me on Pinterest here. For more tips & tricks on conscious consumerism & sustainable lifestyle be sure to follow The Honest Consumer on social media.